PSA/Peugeot-Citroen's debt rating was cut to junk status by credit ratings agency Moody's, after the French automaker announced a 1 billion euro ($1.34 billion) share issue and an alliance with General Motors. The cost of implementing the alliance will hurt PSA's earnings in the short term, Moody's Investors Service said, and cooperation may not produce the savings expected later. Moody's lowered PSA's rating by one notch to Ba1, the highest so-called "speculative" grade with a negative outlook. 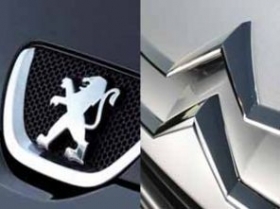 "The downgrade of PSA reflects Peugeot's fiscal year 2011 results which have been well below Moody's expectations," Falk Frey, Moody's lead analyst for PSA, said in a statement on Thursday. "The downgrade further incorporates PSA's challenges to improve its financial metrics over the short to medium term following a severe deterioration in 2011, and more important turn around its loss-making core automotive business," Frey said. Moody's noted that past mergers and alliances in the automotive industry have often not resulted in the anticipated competitive advantage and improved performance. PSA spokesman Jean-Baptiste Mounier said the Moody's downgrade was linked to an evaluation of its earnings and had nothing to do with the GM agreement. PSA last month reported a recurring operating loss of 92 million euros ($123 million), compared with a profit of 621 million euros in 2010. In February, the automaker announced plans to sell assets and delay investments as net debt more than doubled in the second half to 3.4 billion euros. General Motors Co. will buy a 7 percent stake in PSA to become the second-largest shareholder after the Peugeot family as part of a broad strategic alliance between the two automakers. PSA will also sell new shares in a 1 billion-euro rights offering. "Though Moody's recognizes that the announced management initiatives, including the capital increase, will provide the company some time to implement operational improvement measures and reap some benefits, the negative outlook reflects the risks of a more negative light vehicle demand in Europe, and especially in PSA's core markets," Frey said. Automotive executives have forecast that European car sales will decline in 2012 for the fifth straight year as consumers hold back purchases amid concerns about the region's sovereign debt crisis.